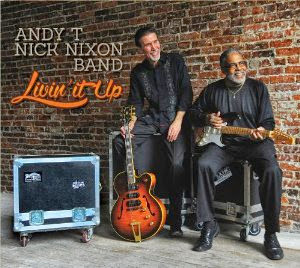 I just received the newest release (June 17, 2014), Livin' It Up, from Andy T - Nick Nixon Band and it really hits the spot. Opening with Baby Right Now, a cool 12 bar number highlights Nick Nixon on vocals and Andy T with some sweet guitar riffs. On Best In Town, a Jimmy Reed like tune, Christian Dozzler steps in with a cool harp solo and Larry Van Loon provides solid piano work in support of Nick and Andy. Delbert McClinton's Livin' It Down, a light Latin twist give this track just the right amount of spice. Bassist Sam Persons adds rhythm guitar on this track and Ron Jones beefs things up a bit on sax. Jim Klinger keep a tight rhythm on drums and Nixon really does a nice job on the vocals on this track. T - Bone Walker's, My Baby Is Now On My Mind, gives Andy a really nice format to play some tasty T-Bone inspired riffs. Dossler takes the piano role on this track pushing Andy just enough to get him swinging. Very nice! Good Man is a deep Texas blues and Andy is diggin in from the first note playing some of the bluest guitar riffs on the release. Nixon has great voice and complimented by Van loon on piano, this track is perfect for highlighting his style. Excellent! One Note Shuffle is a great romp featuring Dana Robbins on sax and Van loon on B3. Andy steps up laying down some really nice riffs for a really cool, easy going instrumental. Back Down South is a low slung blues number with hot vocals from Nixon and stinging guitar riffs from Andy. Ron Jones adds a roundness to the overall track as well as a cool solo with his solid sax work. Boogie rocker, Last To Leave, features Dozzler on slick piano riffs, some hot horn work from Robbins and Andy lays down some tasty guitar riffs supporting Nixon with his powerful vocals. On Let's Say It's For Good, an easy swing track, Van Loon and Andy each lay down some really nice licks. Snake In The Grass has a funky beat and Nixon gets right in the groove. Van Loon on B3 does a really nice job and Andy plays more slashing style riffs on rhythm guitar before laying out a cool funky guitar solo grabbing it up tight. Spiritually infused, Whatever You Had You Ain't Got It No More is a really cool track and not only are Nixons vocals powerful, I really like the effects created by Jones on sax. Andy stands tall with his guitar followed by a really cool sax solo from Robbins. On R&B track, Oh Baby, the band is steppin high and Andy gets right on the top with pure style. This track is particularly well suited for Nixon's vocal style. Robbins puts up a full sax solo adding to the muster on this track. Wrapping the track is Love At First Sight, a soul style ballad, featuring heartfelt vocals by Nixon, gospel style piano work from Van loon and nice sax soloing from Dana Robbins. This is a solid release which is quite soothing.